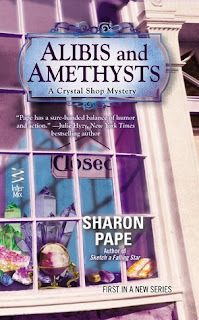 by Daniel Yazzi from Alibis and Amethysts, the first book in the new Crystal Shop Mysteries by Sharon Pape. I'm Daniel Yazzi. You may have heard my name mentioned when Jaye and Sierra stopped by here to talk about the murder case the three of us recently solved. We're all real proud of that accomplishment, but we're even more relieved by it. This wasn't any old murder case; Jaye and Sierra were the prime suspects. But before I get ahead of myself, Jaye asked me to tell you folks a bit of my personal story. I'm Navajo, born and bred. Grew up in Tuba City on the reservation here in Arizona. I didn't leave the rez until I went off to college, Arizona State, Flagstaff campus. Being away from the rez was an education all by itself. The first year or so I went a little wild. Nearly got myself thrown out. Too much partying and not enough studying will get you there every time. My mother sat me down and laid it out plain and clear. If I didn't want to throw away my future, if I didn't want to end up like my father, I'd better buckle down and do the work. Without even raising her voice, she scared me back to reality. My cousin George, who's two years older, was my best friend as far back as I have memories. I used to envy him, because he always seemed to know what he wanted out of life. He dreamed of owning a business, but not on the rez. He wanted to live and work in Sedona. After high school, he blazed the trail to ASU that I followed. Right there at my graduation, he pulled me aside and asked if I wanted to partner up with him in a tourist business. I must have caught his dream when we were kids, because I said "yes" before he could finish the question. We worked whatever odd jobs we could find and saved every penny. Okay, almost every penny. As soon as we had enough to make a down payment on a big, open-air Jeep, we were in business. We take people on off-road tours of the Red Rock Country. We tell them about the history of the place and show them where the Psychic Vortexes are supposed to be located. It was a struggle at first, but we kept at it and now we're doing okay. We have two of those Jeeps and a small office in uptown Sedona. It's not like we're millionaires or anything, but we make enough to pay the bills and help our families back on the rez. And we enjoy what we do. What more can a man ask for? Well, maybe one thing - I sure wouldn't mind finding the right woman to share it with. 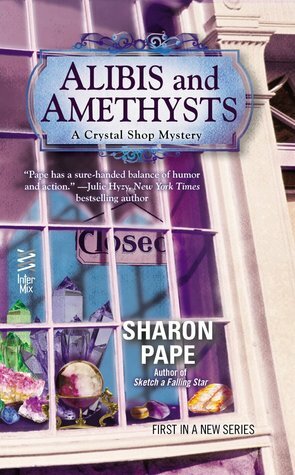 Getting back to that murder case I mentioned, you'll be able to read all about it on August 20th when Alibis and Amethysts is released. Finding the real killer before Jaye and Sierra were arrested, was serious business. But we still managed to have a lot fun along the way. I'm looking forward to reading about your tourist business and solving the murder. If I had time for vacations, I'd book a tour with you!